I’ve had lots of hard days in Colombia. I’m woman enough to admit that. There was the Virus o’ Death and the time I made a scene in an airport. There was the apartment flood and the day my computer crashed. Oh, and that one particular ride home from the valley when I nearly tossed my cookies. And then, there was today. And well, the thing is, I miss my parents. ‘Cause they’re pretty much rockstars. Okay, that’s a stretch. Daddy’s a redneck bread man and Momma’s a banker with the sweetest Southern drawl in three states, but they’re rockstars to me and I miss them. My students were asked by the administration to make cards to give to their parents at a school wide assembly this morning. 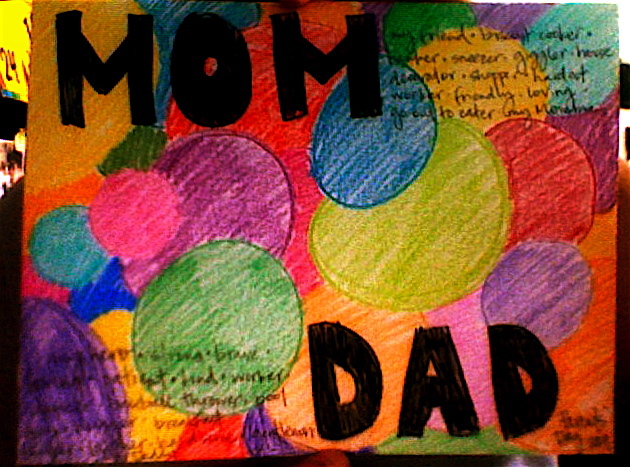 I wanted the ones we did to be extra special and something that moms and dads would hold onto for a while. I even promised blow pops to kids that made their parents cry with their words. Trashy excuse for bribery, I know. For good measure, I made one of my own to use as an example. My parents haven’t seen it, so I guess they didn’t cry and I didn’t shed a tear making it. Not even one. Because why would I? I mean, I’m an adult for cryin’ out loud. And I’m not emotional at all. Really. MOM: my friend. biscuit cooker. banker. sneezer. late night giggler. house decorator. bargain shopper. hardest worker. go out to eater. my Momma. DAD: my hero. strong. brave. loving. kind. worker. dancer. baseball thrower. pool fixer. hugger. breakfast buyer. laugher. my Daddy. I bet you find lots of switches. Thanks for the orchard you share! I love this Em. I didn’t cry either but barely. I’ve always heard you appreciate your parents more, the older you get. Don’t get me wrong, I’ve always appreciated my parents, but now that I’m older AND I’m a parent, I most definitely appreciate everything they sacrificed for me.